Beachfront Villa guests will find their private slice of heaven with direct access and unparalleled views along the island’s two longest beaches. Luxury Residence guests are tucked away in their own private haven surrounded by unspoiled lush landscapes. Both offer luxury living at its finest with traditional Fijian design, contemporary indulgences and seamless hospitality. The 5-acre farm puts beachfront, poolside or in-villa farm-to-table dining at your fingertips. 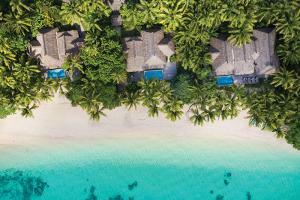 With many water, land and wellness activity options, the inter-generational traveler will find vacationing effortless on Kokomo Private Island Fiji. Located on a private island south of Viti Levu, approximately 45-minutes from Nadi Airport. Transfers are via helicopter or seaplane. Chef’s Kitchen – farm-to-table catering; Beach Shack – beachfront dining; Walker D’Plank – Asian inspired street food; Pool Cabana – wood fired pizzas and charcuterie.